This hack have different direction when you compare my previous hack. First, trolls (ex. invisible coin blocks etc...) do not exist. Second, this hack will have short length than previous hack. This hack contains 5 exits total. 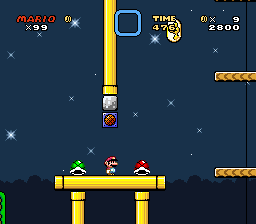 Feedback would be really nice, If you played this kaizo hack! 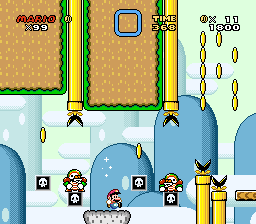 Edit : Updated big boo boss fight, so it would more fair! Edit 2 : Final Update! (for now) Check below my thread! as stated on discord, i give you my feedback here. 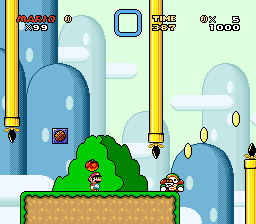 (i only played the first 2 levels). as you remember, there are a few parts that you can "skip" or rather not have to shell juggle like you tell the player to. HEY I PLAYTEST SO IM ALLOWED TO SAVESCUM! 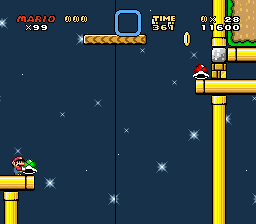 also not being able to scroll to the left in this level can be frustrating. you'll try to move the cam as far to the right as possible to see whats coming. oh a shell just got kicked into the abyss... well i cant scroll back to the left to make it respawn, gotta kill myself now. i also think reusing the same thing several times is not that much fun, nor challenging. its a bit annoying and makes me feel like you ran out of ideas. i could show more examples of you repeating the same thing, but i think you get the point. doing it once, or twice (or maybe even 3 times) is okay. but using it as often as up to SEVEN TIMES is too much and too boring. If you have any problem of my hack please let me know!